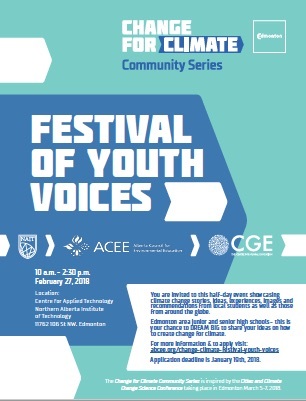 ACEE is pleased to be working with the City of Edmonton, NAIT and the Centre for Global Education to showcase the climate change stories, images, experiences and ideas of students from Alberta and around the world. This is open to ALL and you are invited to attend and engage with these students and be inspired by their initiatives and leadership. Bring your high school students down for a powerful learning experience. Please RSVP to kathy@abcee.org if you are thinking of bringing down a group of students (booked first-come, first-serve). Understand where the Wetland Education Network is at and have a say in where it is headed. Advancing Wetland Education in Alberta: Best Practices to Lead Change on Thursday March 1 from 9:00am – 3:00pm in Leduc at the Executive Royal Hotel. Who should come? Anyone who wants to learn about how we can use education and outreach for ALL audiences to improve wetland health in Alberta. This includes individuals in any stakeholder group including various industries, agricultural groups, municipal and provincial government staff, local watershed groups, educators, etc. All are welcome and needed to advance this work. Students On Sustainability is a joint initiative between the Alberta Council for Environmental Education and a dedicated group of University of Calgary students. We are offering free, curriculum aligned, engaging classroom presentations on topics surrounding sustainability and climate change to Calgary classrooms this semester. Inspirational and passionate university student presenters who are experts on a variety of sustainability topics. Every presentation includes a hands-on activity that engages students in sustainability topics and enables them to take action. Each class will have a "call-to-action" and make a plan to take environmental action in their homes, schools, and communities. Our lessons typically take 1 hour and can be completed in 1-2 classroom visits. This is a pilot program with limited presentation slots, so book early to avoid disappointment. For topic/presentation information, click here. For general program information, please visit our website. To book a presentation now, see our booking form. ACEE offered two full-day learning opportunities for teachers from Grande Yellowhead School Division (November 28th) and Fort McMurray Public Schools (January 19th). The schools continue to further enhance and embed environmental education into student learning and advance the work in their school divisions. Each group has their own Google folders with resources, information about their initiatives and more. The Alberta Narratives Project is a new approach to public engagement research that builds skills and better energy-climate communications. The project aims to uncover language and narratives that reflect the values and identities of Albertans, and to find ways of talking about climate change and energy that can build bridges to better conversations. 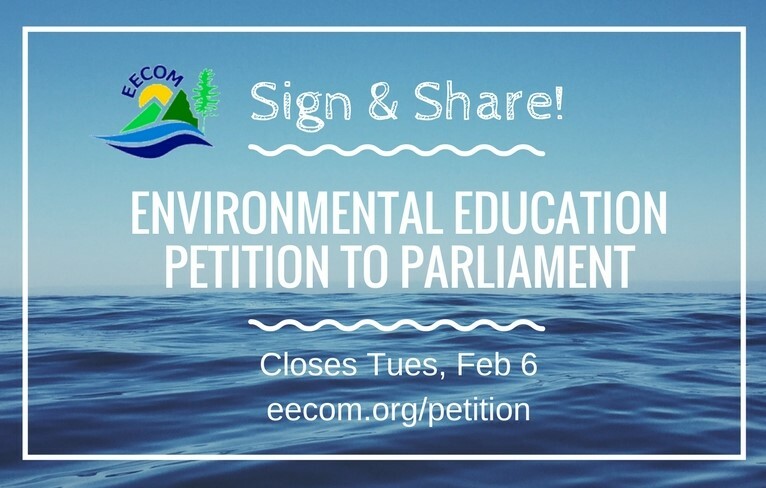 Environmental educators from coast to coast to coast have been working on a Petition to Parliament to support Canada taking a leadership role in enacting a Canadian strategy that supports environmental education. Professional Learning - Become a WILD Education Instructor! Below Zero and Project Wild Introductory Session. March 3 in Edmonton, 9:00am - 4:00pm. The workshop is designed by the Canadian Wildlife Federation to support educators in incorporating environmental education and environmental sustainability activities into their classroom or activity group. The activity guides feature more than 150 hands-on, pedagogically proven lesson plans. Learn more and register here.